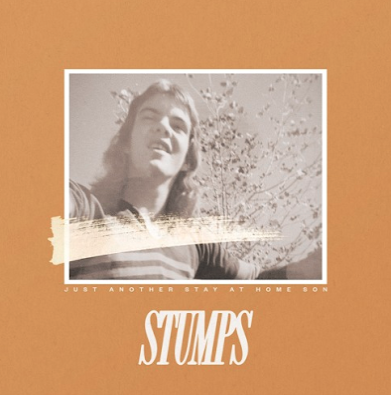 STUMPS has been floating around in the music scene for some time now, often popping up as an opener for another act, as well as slowly dropping their singles 'This Home is Mine' and 'Piggyback'. Their most recent EP Just Another Stay At Home Son has been out for almost two weeks and it provides a thrilling look into the sound that STUMPS has created for themselves. STUMPS’ sound is something of an enigma in the Australian music scene — striving to stay away from the nation's growing indie-rock sound and opting to showcase vocals reminiscent of early Kaiser Chiefs and The Clash, also funnelling that Brit-pop/rock sound in their music. They’re driven by the drumming of Jonno Dolan as well as the smooth, shifting vocals of their lead singer, Kyle Fisher. STUMPS’ EP isn’t long, boasting only five tracks, but STUMPS manages to put their vivid sound and energy into every single track leaving you excited for more. 'This Home Is Mine' opens the EP’s account with a catchy bubbly guitar riff and infectious flowing vocals with some real punch. A mixture of bouncing rhythms and Fisher’s vocals make the track easy to dance to and the lyrics, quick to pick up — resulting in a jubilant and energetic opening foray to the EP. Quick as ever to amp up the energy and keeping high — a theme present in Brit-rock — their second track 'We’ll Do It Anyway' blasts into fruition immediately, leaving you almost reeling with no time between 'This Home Is Mine' and 'We’ll Do It Anyway'. 'We’ll Do It Anyway' is skillfully weaved together, the guitar line pushes and moves the rest of the song with a ‘crash and bash’ feel present in the drumming style. The vocals help build this pushing, running atmosphere with Kyle bringing jumping and scratchy highs with his weighty, hearty lows all working to create a track that is hard not to move too. Much like the speed that the song starts with, it is also quick to finish — lasting a touch over three minutes but never taking the pedal off of the gas until the end. 'Matthew McConaughey' is a whimsical portrait of an individual who aspires to one day be similar to Matthew McConaughey. It’s both catchy in tone and lyrics, with an excellent hook in “Someday Maybe / I’ll be like Matthew McConaughey”. It slows the energy back a touch for the most part, but blast out the fast and golden sounding guitar lines after the bridge of the song. 'Matthew McConaughey' contributes more to the EP vocally, letting Fisher shine with his almost bleeding heart, yelling after the bridge and his smooth lower vocals in the slower earlier mix of the track. Much like other tracks, the drumming keeps the song kicking in 'Matthew McConaughey', especially in the back end giving it that feeling of pace and speed. But, it is that slightly vague feathery guitar that seems to stand-out when the drum kit eases back. 'Piggyback', the band’s first single from the EP, is as radiant as ever. It is a track that never seems to get old. With lyricism to do with friends, beers and how to get home after a big night out, it hits home — easy for many to relate to and a lot of fun to listen too. 'Piggyback' brings a real bopping feel throughout its walking bass line and vocals that fall in line with the rhythmic feel. The drums also help create this feel, with the snare levelled to make it the obvious beat marker above the bass drum. The song is a lot of fun and is a solid way to keep the energy up high before the ending track of the EP in 'Toulouse'. 'Toulouse' closes the inspired sound of STUMPS’ debut EP, and while it doesn’t fire at you with the energetic strumming and crashing drums of earlier tracks, the melancholic guitar picking and almost laid-back saddened vocals of Fisher stand out compared to other tracks. There is still energy through 'Toulouse' — but it is a reserved energy, like something is being held back, not the full-throttle assault of earlier tracks. 'Toulouse' is an appropriate full stop for the album, ably demonstrating the full range and ability of the band and displaying their willingness to create songs that are emotive in sound and message. The group “Woo-oos”, backing the vocals help build the atmosphere of controlled emotion and coupled with a reserved drumline that makes 'Toulouse'’s focus directly on the vocals. Just Another Stay At Home Son is an accomplished first EP from a band that is emphasised by its exciting sound that stands apart from much of what is currently being waded out into the Australian music scene. The EP is STUMPS' blaring war-cry and statement as artists that they’re ready to move into the next stage of their bandhood.